This morning we continue our 2012 collaboration with the Vermont Humanities Council’s statewide reading program, Vermont Reads. In this excerpt from Bull Run a carriage driver who has carried civilian spectators to watch the Battle of Bull Run describes the retreat of defeated Union soldiers. "All that night and the following day the soldiers trudged across the Long Bridge, sodden, sullen, the very picture of defeat. They dropped asleep on the sidewalks and porches. Kindhearted women made vats of soup, set them by the street, and fed the famished lads. Staggering along through the rain, they looked a parade of ghosts. My eyes shall never forget it. How my passengers railed against the soldiers! And their know-nothing officers, and the profiteers, and the press, and the generals, and the President." The naive enthusiasm Northerners initially displayed as the country marched off to war was soon eclipsed by harsh reality. By 1862, new regiments were finding it difficult to fill their quotas, even here in Vermont, where support for the Union was strong. Some soldiers were appalled by those who looked to avoid the war. 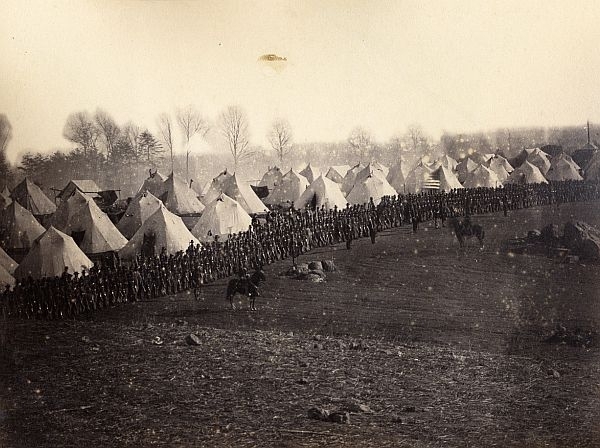 Albert Sabin of Rockingham, a Middlebury College student serving in the Union army, wrote about it in a letter to the Rutland Herald. Here’s a passage from Sabin’s letter. "It is possible that we have Vermonters so mean, so cowardly, so utterly destitute of honor, manliness and decency as to slink off to Canada lest they be compelled to serve their country. I blush for shame every night as I lie with uncovered head upon the soft earth, or perchance a block of stone, and gaze up to the quiet stars beaming so calmly upon me and saying, "peace, be still, war is for the hour, peace for ever." "The hand that supports us in our trackless orbits will protect and shield the faithful soldier. I thank god every day of my life that I came out when I did to serve our common country. I think our ancestors the brave green Mountain Boys of Vermont, must look down with wonder on their degenerate sons, going about in crowds with their certificates of disability in their pockets. But I will glory in the men now coming into the field. They are saving our state from disgrace, posterity will call them heroes." The struggle to capture and describe the experience of war informed more than just the letters that soldiers sent home to family and hometown newspapers. Sketch artists also followed the troops. And so did practitioners of a brand new technology. 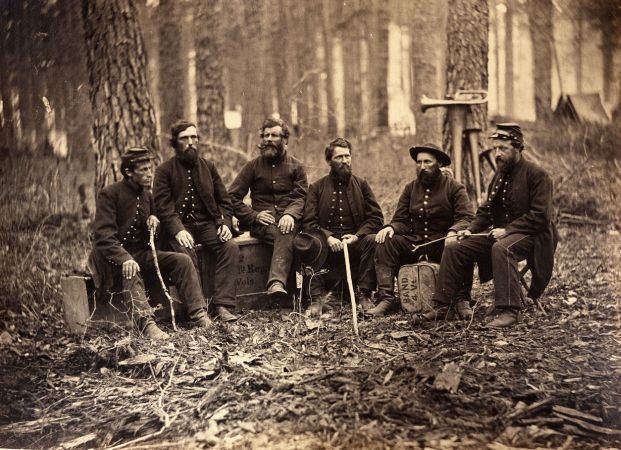 Historian Donald Wickman’s book, "A Very Fine Appearance" is about the remarkable images of Civil War soldiers taken by pioneering photographer George Houghton of Brattleboro. "Because he was very adventurous, he wanted to serve in the war, but I believe he probably had some onset of consumption or tuberculosis, that caused him to not be accepted for enlistment. He was also well into his 30s at that time, which wasn’t unusual to accept people that age, but he was eager enough to want to go and follow along with the troops. And he made three trips to Virginia to visit with the first Vermont brigade and then the second Vermont brigade. The best thing he did is he was able to capture life of the soldier. He was there to capture the scenes of the men in camp. And that’s what I think people were clamoring to see. What was life like? One of his greatest photos that he took was also capturing something that Northerners didn’t see, was a slave family outside of Richmond. And that’s one of two Houghton images that are in the library of Congress," Wickman said. It was significant because most of what happens in war is sitting in camp and waiting. It’s the sitting and waiting in camp. And he was able to capture much of that life. "That’s what’s so fun about looking at the pictures. You get to see for example the band of the fourth Vermont on the Virginia tidewater peninsula, you look out and they’re sitting on their music cases. The horns are draped onto branches behind them, you start seeing holes developing in the tents from wear, and the men are almost beginning to show etchings of lines from the stress of being under combat even that early," Wickman said. Technology may have changed since Houghton’s day, but the impulse to document war and understand its impact on both individuals and society continues, and modern examples abound. 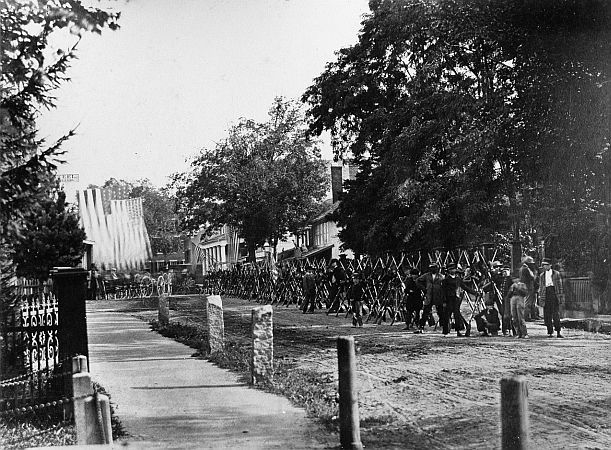 "It is well that war is so terrible," Robert E. Lee reportedly said during the Battle of Fredericksburg. "We should grow too fond of it." Yet in a sense, many wars are fought many times, first on the battlefield, and then again in poetry, novels, movies, songs, even live re-enactments. For some film-makers these days, the most honest way to show the impact of war is to let veterans do their own talking in a documentary. That’s what Sara Nesson decided to do after she met Sergeant Robynn Murray, a one-time high school cheerleader and merit scholar returned from Iraq a mental and physical wreck. The film is called Poster Girl because Murray was once featured on the cover of Army Magazine. As Murray told students at Johnson College earlier this spring, she went into battle as a wide-eyed teen-ager, but became a rarity, a female gunner, shooting from a tank sometimes rolling through civilian neighborhoods. Then came a cruel turning point. "It would be after my friend Monroe died. He died in a rocket attack on our forward operating base. That was kind of, iit was the first time, me as a young person, realized that I was not immortal, and neither were my friends," Murray said. Murray was injured, and returned to Fort Bragg, where, she says became even more disillusioned about war. "I think that’s another big turning point for me where I was like, you know, this is really ridiculous. These people really put their lives on the line and nobody even (a) knows what happening to them or (b) cares," Murray said. Murray was finally diagnosed with PTSD, and although getting the benefits she needed for treatment took a long time, she did find therapy with a group of vets who were making paper and art from shredded combat uniforms. That’s where Murray met film-maker Sara Nesson. She let Nesson and her camera into her most intimate post-war moments. The result, Poster Girl, was nominated this year for an Academy award. Both women attended the ceremony. "It was incredibly validating as a film maker to have started this film in my back yard with no budget and then to be standing here with Robyn and to be recognized in that way and to help spread awareness of what veterans are going through," Nesson said. Nesson and Murray hope their film sends a message of hope to vets about the way creative outlets and frank conversation can jump start the recovery process. They often invite the audience to stay after the screening and ply them with questions. At Johnson State College, one young woman asked, "what do you think needs to change?" "One of the biggest things I would like to see in my own area in New York state that Vermont seems to be on the ball on is transitional housing for veterans cause we have a lot of vets going through rehab like I did or programs for PTSD that are six months long, you have different programs that are three months or six months or nine months that are kind of to introduce us back into society as functioning people, and I know that New York state is in desperate need of housing for that," Murry replied. As for Murray, you might say she has become a different kind of poster girl – a public example of recovery and renewal. She lives with her fiancé in upstate New York and just finished her first book of poems. A contemporary view of difficulties that have plagued soldiers for generations. Our series, Vermont Reads, Bull Run and The Red Badge of Courage concludes tomorrow with a look at the legacy of the Civil War, and the impact of war in general on Vermont and the nation.